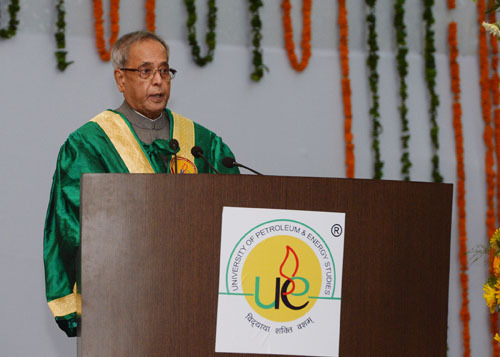 It gives me great pleasure to be here today for the Eleventh Convocation of the University of Petroleum and Energy Studies (UPES), which is a premier institute for professional education in our country. I thank the University management for inviting me to be a part of this beautiful occasion. I am truly overwhelmed by the lush surroundings of the University Campus. Established ten years ago, UPES is India’s first energy university, running fifty two specialized programmes in the fields of oil and gas, power, infrastructure, electronics, logistics, information technology and international business. I compliment this unique abode of higher learning for its efforts at producing highly trained and competent manpower for national development. Uttarakhand recently suffered from massive flood and landslide that resulted in loss of large number of precious human lives. Many people suffered from heavy damage to property. I urge the adequate mobilization of all possible resources in rebuilding the lives and hopes of the people. In times of adversity, we should never let go the indomitable human spirit for survival and rejuvenation. Convocation is a very important event in academic calendar. This day marks the culmination of the formative phase of an individual. It also signals the beginning of another phase – a long journey with a much bigger task ahead. I congratulate all the graduating students who have toiled hard to achieve success in rigorous education streams. India is an aspiring nation. Its forward march must be spearheaded by the youth of our country. An awakening of the minds is necessary. Remember that you are amongst the brightest young people in India. The governance of our country and issues of national importance should excite you. Read, analyze and formulate views on them. A healthy democracy is marked by informed participation. Inform yourself and inform others. Help the nation create better citizens who understand their rights and responsibilities. India is in the midst of a major demographic transition. 12 million people are added to our working age population annually. Within a decade, we can boast of having the world’s largest workforce, which will account for two-third of our population. We must make this demographic dividend count. We have to equip our youth with capacity and expertise. As per a survey, only 7 per cent Indians of working age receive vocational training. A majority receive only non-formal training. Large scale formal vocational training is required for developing a capable workforce. The centrality of high economic growth for a developing country like ours needs no emphasis. Our average economic growth per year during the Eleventh Plan period was 8.0 per cent. We have envisaged growing at this level during the Twelfth Plan period also. Though our economy is challenged by global factors in the short term, we must feel confident that we will be able to overcome these hurdles. I have confidence in the youth of the country that they will overcome all hurdles. Our economic progress will depend on how well we marshal crucial growth centres like the energy sector. India is the fourth biggest consumer of energy in the world, after US, China and Russia. To sustain high levels of consumption, our energy resources are inadequate. Energy Intensity, which is a measure of energy efficiency of an economy, indicates that India uses more energy to produce one unit of GDP, than nations like UK, Germany, Japan and US. To achieve a high growth rate while meeting the energy needs of the population poses a challenge to us. It calls for higher energy production and for devising measures that promote energy efficiency. We must explore alternative energy models to reduce our dependence on conventional sources. A greater intensity of science and technology in the energy sector is required today. There is need for domain knowledge, for developing capabilities and strengthening systems through innovation. Policy making should be proactive to identify problems, highlight trends, develop scenarios, and recommend policy options, so as to avert any crisis. If an academic framework to various issues associated with energy could be provided, it will significantly contribute to the understanding of our policy makers. We must have a pool of institutions in our country dedicated to raising the technological capabilities of our energy systems and expanding the knowledge frontier on issues of energy and energy security. UPES, as a specialized energy university, has a crucial role to generate state-of-art knowledge to fulfill the needs of the energy sector. Dr. S. Radhakrishnan had said and I quote: "A life of joy and happiness is possible only on the basis of knowledge and science” (unquote). Knowledge can spur far-reaching progress. Our higher education sector must be equipped to complement the economic forces. Despite a credible infrastructure in our country – over six hundred fifty degree awarding institutions and over thirty three thousand colleges – there is a paucity of good quality institutions to meet the growing aspirations of our youth. It is a matter of concern that an international ranking of top two hundred universities does not contain a single Indian institution. This is an eye-opener for us, especially as our ancient universities like Takshashila, Nalanda, Vikramashila, Valabhi, Somapura and Odantapuri had dominated the world higher education system for about eighteen hundred years beginning Sixth Century BC. The ancient Indian universities attracted students from all over the world. But today, many bright young minds from India go abroad for better quality higher studies. We have the capability to turnaround our higher education system. We can develop our academic institutions to provide education conforming to international standards. We can usher in excellence in the way our institutions are run and education in them imparted. The time of static academic institutions responding cautiously to new challenges is over. Academic institutions are a service provider and the quality of service delivery matters. Students are an active recipient of education. They are demand centres and increasingly seek to redefine knowledge requirement. The institutions must be proactive, dynamic and interactive. The benefits of technology should be applied to enable refinement in teaching methodology. For instance, e-classrooms can overcome physical distance by virtual diffusion of information and knowledge. We must infuse in our students life skills such as self-awareness, empathy, effective communication, creative thinking, problem-solving, inter-personal relationship, and stress and emotion management. These skills are necessary for healthy development of an individual, and should find due place in the course curriculum. Our academic institutions also have a duty to address the moral challenges of the times. They must act as guides and inculcate the essential civilizational values of love for motherland; performance of duty; compassion for all; tolerance for pluralism; respect for women; honesty in life; self-restraint in conduct; responsibility in action, and discipline in the minds of our youth. Technological applications have improved the lives of common citizens across the globe. To effect beneficial changes in society, we must strengthen the drive to innovation. It will also give us an edge over our competitors. As per an international survey, 3 Indian companies are amongst the world’s 100 most innovative companies. We need to improve on this record. We must revitalize research and development. Research is unfortunately not a preferred option, accounting for less than 0.4 per cent of our higher education student population. To promote a healthy environment for research, we must increase the number of fellowships, support inter-disciplinary and inter-university collaborations and establish industry incubation parks. The decade 2010-20 has been declared in India as the decade of innovation. The Science, Technology and Innovation Policy, unveiled this year, aims at innovation-led development. This policy portrays the need to right-size our research and development system. It delineates a strategy for encouraging novel ideas that can benefit the common man. Our higher academic institutions should take the lead in mentoring grassroots innovations for their development into viable products. I am happy to witness today the exciting innovations made in UPES. I am told that patent has been granted on the multi-fuel cook stove. I call upon this University to continue pursuing research and innovation in a big way. Dear Students, as you leave the portals of this Institute today, remember to overcome the challenges in life by the strength of character and depth of knowledge. In the vast ocean of knowledge, you must be eager to learn from every wave that reaches the shore. You must have a thirst for knowledge and that thirst must remain with you for life. Success will belong to lifelong learners. Wherever you are, whatever you do, never be shy to learn. I am sure you will take the path of hard work, sincerity and conviction to be a winner in life. I wish you all the very best. I also wish the management and faculty of UPES all success.